Other Publication Information: Soft boaund, Illustrated with (314) color photos, (5) black & white photos and (69) illustrations; 153 pages. If you have always liked the Northrup YF-23 design or are just interested in advanced aircraft this book may be of interest to you. It was written by Paul Metz who happened to have been Northrup's Chief Test Pilot for the YF-23 ATF DEM/VAL phase. (Demonstration and Validation) With his knowledge of the aircraft and it's performance he has been able to pull together a great collection of material to give you the reader unique insight into this program. This work comes in the standard size (8.5" x 11.5" x 5/16") and consist of 153 pages on glossy paper, also 290 color photos as I count them, 20 pieces of aircraft artwork showing various preliminary configurations, 25 charts and 38 technical drawings. It starts with a brief explanation of the concept of Stealth, then follows with the evolution of the Advanced Tactical Fighter ( ATF ) from 1981 to 1985. In October 1985 DOD issued a Request For Proposal ( RFP ) for the DEM/VAL phase where advanced concepts would be validated with wind tunnel tests, simulations and with other means, but no flying prototypes. Then in May 1986 a radical change came when the RFP was modified to include two flying prototypes. In June 1986, the seven companies that had responded to the original RFP turned in their paperwork for the modified proposal. Two companies were chosen and announced on October 31, 1986, Lockheed and Northrup. Lockheed teaming with Boeing would build two Prototype Air Vehicles ( PAV ) designated YF-22 and Northrup teaming with Mc Donnell Douglas would build two PAVs designated YF-23. In addition, two Advanced Propulsion systems would be tested; Pratt & Whitney YF119-PW-100 and General Electric YF120-GE-100. In the Northrup program PAV-1 (USAF S/N 87-0800) would fly with the PW YF119 power plant and PAV-2 (USAF S/N 87-0801) would fly with the GE YF120 power plant. This book continues with the construction of the two PAVs and details the many test flights these two planes flew. As the author was one of the pilots a lot of interesting details have come to notice. When the flying phase ended in 1991 the two PAVs were put into flyable storage awaiting the award to one company to build an operational fighter. The book notes the subtle changes made to the F-23 proposals that came about from lessons learned during the DEM/VAL flights. Unfortunately, Northrup did not win the contract and Lockheed went ahead to build the F-22. Many new things are in this book that I was totally unaware of, such as Northrup devoting design time and efforts to build a Naval Advanced Tactical Fighter (NATF). The Navy required the NATF to fit into the same space as the F-14 then in service. Northrup changed the configuration around to accomplish this, but it never went beyond models, artwork and drawings, which this book had two pages of details engineering drawings. Perhaps someone may want to try to make a model from these drawings, it would make a wonderful "what if" type of aircraft. Also mentioned is the work Northrup made towards creating a bomber version, F/B-23. A great many pages are used going into great details on the YF-23 planes, which would be useful to any modeler you has one of the models of this plane. This includes color photos of the cockpit, main and nose landing gear and bays, underside locations of vents and antennas on the two PAVs. Various systems are discussed and show in detail; hydraulic systems, propulsion systems, inlet and boundary layer controls, flight controls and avionic systems. Four full pages of detailed engineering drawings on the YF-23 are also included. When Northrup lost the ATF contract the two PAVs were put into long term storage exposed to the elements. By 1996 looking the worst for the wear the two PAVs went to museums. PAV-1 was restored by the National Museum of the United States Air Force and is on display there now. PAV-2 was restored by Northrup employees and is at the Western Museum of Flight at Torrance Airport. Ginter's books always end with a review of available models for the titled aircraft and this work is no exception. Two 1/144 kits, three 1/72 kits and two 1/48 kits were built and discussed. A possible 1/32 model was also shown so one can always hope. 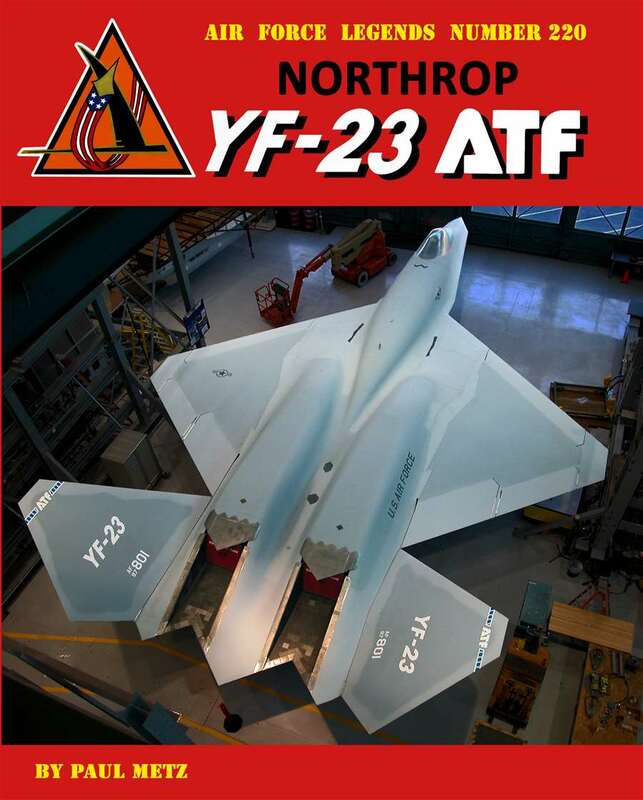 You will not find a better published work detailing the Northrup YF-23 program. It is very comprehensive, full of color photos and drawings that any modeler, historian or aviation enthusiast would find vital to his or her needs. I can greatly recommend this book and want to thank Ginter Books and IMPS/USA for the opportunity to review this fine work.